Dr. Gabriela Stein (Psychology) was named a Minority Access National Role Model through Minority Access Incorporated. The award recognizes her achievements in her field and in advancing underrepresented minority groups. Stein has previously served in leadership positions in influential academic organizations and is an associate editor at Journal of Research on Adolescence. Stein’s research uses developmental psychopathology and cultural-ecological frameworks to investigate the impact of culturally relevant factors on the development of psychopathology for ethnic minority youth and families. In 2012, her students nominated her for the Latino Diamante Award in 2012, for her educational contributions to the Latino community. Travis Hicks and his students build more than just structures – they are building a legacy. The associate professor in UNCG’s Department of Interior Architecture and director of the Center for Community-Engaged Design (CC-ED) is intentional about guiding students’ work that develops out of and enhances previous research. Interior Architecture MFA candidate Jessica Ocasio is one student building on the legacy left by alumni who started researching and designing tiny houses four to five years ago to address affordable housing in Greensboro. Ocasio is designing three types of microdwelling communities to offer young adults more affordable housing options and works closely with Hicks as a student fellow with the CC-ED. A native of Puerto Rico, Ocasio completed an internship with Tiny Houses Greensboro, where she designed a 288-square-foot tiny house for North Carolina’s very first tiny house community at 4120 Causey Street. The community is a permanent affordable housing option for those experiencing homelessness. Hicks trains the next generation of designers to consider the needs of all communities, including those where resources are limited. The program promotes the sustainable use of resources and emphasizes the human component. Ocasio is working on a tiny house village design for The Farm at Penny Lane in Pittsboro, affiliated with UNC Chapel Hill’s Center for Excellence in Community Health, which provides farm therapy for clients with mental disabilities. In May, she plans to continue taking steps toward owning her own interior design firm with a focus on tiny houses. Ocasio is laying the groundwork for future IARC students. “Jessica’s work will benefit the work of future students who are interested in sustainability, reducing one’s footprint and designing for users of different socioeconomic backgrounds,” Hicks said. That’s Lester Rogers, supervisor of the UNCG Steam Plant. That steam heats most of the campus. If your building is warm on a cold day, if the water for showers and sinks are hot, you can thank the people who keep the steam plant operating smoothly. It’s a great old building, supplying heat to generations of UNCG students. With a staff that keeps it going, around the clock, no matter the weather. That’s a nice thought to warm up to. Text by Mike Harris. Photography by Martin W. Kane. UNCG has always been a home to women leaders throughout the university, from Sue May Kirkland and Harriet Elliot to Mareb Mossman and Cherry Callahan, to chancellors Sullivan and Brady. On Bizwomen Mentoring Monday, over 10,000 women across the country will participate in the Mentoring Monday program supporting each other. The event will be Monday, Feb. 12, 8:30 – 10:30 a.m., in the EUC’s Cone Ballroom. Participants will have one-on-one mentoring sessions and will hear tips and stories from other successful businesswomen. This year, there will be more than two dozen mentors and the program is set up for a ‘speed dating’ type approach. Each attendee should have time to be mentored by 5-7 mentors plus time to network with other women attending. The mentors will include several from UNCG: Kim Record, Julia Jackson-Newsom, Terri Shelton and Julia Mendez Smith. Provost Dana Dunn will give brief remarks. And there will be round table sessions on various topics related to women in the workplace. A light breakfast will be served. UNCG and Allegacy are the presenting sponsors. National partners are American Business Women’s Association and National Association of Women Business Owners. Here you can register and find more information about the event. Next week, UNCG will receive a visit from esteemed author Colson Whitehead. His best-known work, “The Underground Railroad,” has been awarded the Pulitzer Prize, the National Book Award, the Carnegie Medal for Fiction and countless other prizes and honors. Whitehead’s research for his novel included slave narratives such as that of Harriet Jacobs, scholarly work, historical dictionaries, seminal works of fiction such as Toni Morrison’s “Beloved” and a remarkable online resource that was created at UNCG and is part of the Libraries’ Digital Scholarship Collections: the Digital Library on American Slavery. Throughout “The Underground Railroad,” Whitehead placed images of runaway slave advertisements that are part of the digital library, giving the fictional work a grounded link to American history. Whitehead will speak at the UNCG Music Building on Thursday, Feb. 8, as part of the University Concert and Lecture series. The lecture, which is in the Recital Hall, is booked to capacity, but there will be a simulcast in the Collins Lecture Hall (Room 217). Reservations for the simulcast are required and available on a first-come, first-serve basis by calling (336) 272-0160. During the event, UNCG Libraries will display an exhibition related to the Underground Railroad and the Digital Library of American Slavery, in the Music Building atrium. Earlier in the day, Whitehead will also meet with a group of students in a discussion group led by Associate Professor of English Noelle Morrissette. Book Discussion of Colson Whitehead’s “The Underground Railroad,” in conjunction with the exhibition of work by Sanford Biggers, with UNCG Associate Professor of English Dr. Noelle Morrissette, March 1, 7 p.m. with pre-talk reception at 6:30 p.m., at the Weatherspoon Art Museum. Sanford Biggers, Falk Visiting Artist exhibition on view at the Weatherspoon Art Museum now through April 8. Biggers will come to UNCG March 15 to give a talk at the Weatherspoon Art Museum at 7 p.m. If you want to help maintain your New Year’s fitness resolutions, the 3S Movement Challenge might be the push you need. The 4 week challenge is a part of HealthyUNCG’s initiative to promote a healthy lifestyle, and will span across the month of February, beginning Feb. 5. There will be weekly prizes awarded at the end of each week, with a grand prize worth $150. The 3 S’s stand for stand, stretch and sip. For the challenge, participants must record how long they stand, the stretches they do and their water intake, all of which can be done at the employee’s workstation. Drink 24 oz. over course of 8 hr work day. Coffee and teas do count, but it is encouraged to drink water in its purest form. Walk a minimum of one minute and increase to five minutes every hour. The winner of the grand prize will be randomly selected, and will be given the choice between a desk elliptical or a FitDesk Kit including dumbbells, resistance bands, yoga mat, foam roller, stability ball with pump, water bottle and gym bag. For more information and registration, visit the 3S Movement Challenge page. For any questions, contact HealthyUNCG at Healthy_UNCG@uncg.edu or 336-334-4131. A Black History Month kick-off will be held Jan. 31, 11 a.m. to 2 p.m., at the EUC’s Maple Room. The event “Walk in my Shoes: Black Identify Dialogue” will be held the next evening, Feb. 1, at 7 p.m. in the EUC Intercultural Engagement office. CW is finalizing a listing of Black History Month events, to run next week. If your department has a Black History Month event and you haven’t sent us the information, please do so today. Note: The Payton Head visit, canceled due to weather in January, is being rescheduled for Monday, Feb. 12. CW will have more information next week. When you hear “UNC Greensboro,” what comes to mind? What’s our distinctive position? People who know us really like us. Not enough people know us. Jeff Shafer posed those questions at last week’s faculty forum, titled “The UNC Greensboro Story: Narrative and Visual Identity Update.” It gave faculty an opportunity to hear about and give input on UNCG’s work in this area. Shafer is associate vice chancellor and chief information officer, and was introduced by Dr. Andrea Hunter, Faculty Senate chair. “We need a compelling, authentic voice that resonates with diverse stakeholders,” he said. A faculty member had told him early on, “Let’s make sure we authentically tell the story of our academic achievement.” He showed examples of UNCG promoting research and learning. The university’s branding committee – composed of leaders from academic, athletic, advancement/alumni, admissions and administrative functions – as well as the agency FUSE IDEAS have spoken with more than 400 people, in a process of discovery. The research has led to several realizations about UNCG. Collective and tenacious focus on student success. Here, there’s a proactive, intentional commitment in this area that sets us apart. Community of earned achievement and pride. There’s a roll-up your sleeves work ethic in academics, research and service – with everyone working hard to make a difference. That helps students and alumni make a difference. A welcoming environment where everyone finds a home. It’s a place to belong and thrive for a vast array of students. The result of these qualities? “UNC Greensboro creates remarkable real-world impact, every day,” he said. That is the truth, but it’s not a tagline, he explained. It may lead to a direction for messaging. Many faculty members spoke at the forum. Dr. Tara Green opened with a question about the presence of global connections in the new messaging. Other faculty members contributed suggestions: About campus beauty. About student success tied to work ethic and working hard. About the faculty being both great researchers and great teachers. UNCG as central to the state’s efforts to be successful. Gender, female identity and UNCG’s history as a women’s college. A suggestion about the value of humor and emotion in branding. Ethnicity and logos. School colors. The need to promote and tell the stories of UNCG’s nationally recognized programs. Regarding school colors, it’s unlikely any colors will go away. It is possible there may be an additional color or two. The team is looking at differentiation from other nearby universities in the area and the UNC system; symbolism; something new with a nod to our history; and style. As for timing, Shafer indicated the plan is to launch anything new in conjunction with the State of the Campus Address and the return of students to campus in August. There are no first drafts of “creative” yet, such as logos, but first drafts will be coming soon. Registration for faculty members is open at workshops.uncg.edu – see “University Communications” tab. UNCG will begin hosting its 4th annual Tournées French and Francophone Film Festival on Feb. 8 at 7 p.m.
A series of six films will be screened this semester, with themes including cross-cultural identity, human rights, immigration, education, and the post-colonial experience in France and across the Francophone world. All films are in French with English subtitles. Director Dieudo Hamadi follows a group of students through the national baccalaureate exam to the nerve-wracking announcement of the results, showing an indelible portrait of the role of education in Congolese society. A sharp observation of the harsh realities of the immigrant experience with a story of resilience, following a mother and her two daughters. A stirring portrait of a young woman on the cusp of adulthood, and an insightful look at life under Tunisia’s repressive political regime. The story of Diouana, an illiterate nursemaid from Dakar who follows her French employers to the Côte d’Azur with dreams of discovering France. 25 year old Grigris dreams of being a dancer despite a paralysed leg. His dreams are dashed, however, when his father falls critically ill, and he resolves to work for petrol traffickers to save him. Julie Bertucelli’s documentary gives unforgettable glimpses into the lives of tweens and teens from different countries who have come to France for reasons ranging from studying violin at Paris conservatory to escaping genital excision. This year’s festival is co-sponsored by the French program in LLC and IGS, with contributions from the IPC Kohler Fund and the French American Cultural Exchange and the Culture Services of the French Embassy. The event will be hosted in the Curry Auditorium (Curry 225). Light refreshments will be served at 6:30 p.m. The festival is free and open to the public, and free parking vouchers will be distributed at each screening. On Monday, Feb. 5, at 5 p.m., the Department of Consumer, Apparel, and Retail Studies welcomes four alumni from HanesBrands, a major player in the apparel world. The Centennial Alumni Industry Speaker Series panel takes place in the EUC’s Cone Ballroom A, with a reception to follow. How does HanesBrands stay on top of best marketing and design practices and keep their products compelling? This panel discussion will feature CARS alumni who work for HanesBrands in various marketing and design capacities, but all contribute to the overall success of the organization. They will discuss how they address a changing landscape, particularly the millennial segment of the population, and stay current in a dynamic economy. “The Changing Apparel Industry Landscape: Marketing & Design Perspectives” is part of the department’s year-long 100-year anniversary celebration. Panelists include Carrie Coyle ‘07, designer; Marla Darden ‘02, product merchandising manager; Kelly Hooper ‘08, assistant marketing manager; Akilah Shaw ‘03, merchandising manager. Series sponsors include Human Environmental Sciences Foundation, UNCG, VF Corporation; NPD Group; and HanesBrands. For more information, visit CARS100.uncg.edu. The Gladys Strawn Bullard Awards recognize and reward members of the faculty, staff and student body of UNCG who provide outstanding leadership and service to the university. Leadership and service are contributions made to the university which go beyond the scope of the normal responsibilities of a student, faculty, or staff member. Examples of leadership and service include, but are not limited to: committee work, committee chairing, spearheading projects, volunteering for university projects, and/or advising student groups. Service may also include departmental, school/college, university, community, and or professional roles. Three awards are given each year (one each for staff, student, and faculty). $1000 awards are given annually to a member of each of these three groups. Students who have completed three semesters of full-time course work. Faculty and Staff who have completed two years of full-time service to the university. All nominations must be submitted no later than Friday, Feb. 16, 2018. Please recommend your student, faculty or staff member for consideration here: hrs.uncg.edu/Bullard. Information about the award is here. For more information, contact Sarah Dreier-Kasik, chair of the Gladys Strawn Bullard Award Committee, at 336.334.9795 or s_dreier@uncg.edu. On January 22, HRL’s Social Justice Diversity Initiative (SJDI) Committee co-hosted a live-stream webinar titled The Presidential Symposium on Racial Justice in Higher Education. The webinar was sponsored by the University of Southern California Race and Equity Center, the College Student Educators International (ACPA), and the Association for the Study of Higher Education (ASHE). A transparent, configurable job classification system and quality position frameworks are key to an effective talent management strategy. Cumbersome, paperwork-heavy position management processes can get in the way. ePositionManagement (ePosition) is an add-on module to PeopleAdmin (UNCGJobSearch) and an online tracking tool for managing positions, classification, and employee compensation. ePosition allows us to effortlessly maintain a comprehensive, single online source for position descriptions, classifications, and organizational structure. Additionally, integrations between ePosition and UNCGJobSearch Applicant Tracking streamlines the entire talent management life cycle, empowering teams to refocus attention on other critical tasks. With ePosition, one can request new positions or make content changes to all types of job descriptions or position data, to include classifications, competency levels, titles, status, labor market adjustments, salary increases, reports to supervisor, and budget–all via an automated workflow that fully integrates to Applicant Tracking to pre-populate the job posting. UNCG Human Resources staff are holding forums to provide additional information on how this tracking tool will speed up the hiring process. Please SIGN UP to attend an Informational Forum. For more information, contact Victoria Benson, deputy chief human resources officer, at v_benson@uncg.edu or 336-334-4510. One thing is clear, in seeing the results of the 2017 Campus Weekly readership survey. You like the relatively new enewsletter. 91 percent of the survey respondents prefer this new enewsletter that has photos; 8 percent preferred one with no photos. “Quick to peruse,” one said of the current enewsletter. “I scan the email and the photos and click on the ones that interest me,” another said. “Pretty” was said more than once. 90 percent believe CW provides you information you can’t find elsewhere. People value CW as an emailed enewsletter. 79 percent said the enewsletter provided the most value to them personally; 19 percent said the same about the CW website with posts. Interestingly, nine percent of the respondents say they look through the enewsletter, but do not click on any stories. Respondents most like Campus Weekly’s featured stories and the Campus People items, followed by calendar items and Spotlight. 76 percent of respondents were staff members. The respondents would like to see more staff items; some want the return of “with the staff” with its hello and good-bye information. What did respondents “like very much?” Photography and accuracy of information are the two that rated highest, followed by timeliness of information and layout/design. What do you want to read about more? Upcoming events and campus news of the moment rated highly. University initiatives and “people and their professional work” also rated highly. A clear majority (76 percent) like receiving it on Wednesday. Tuesday came in second with 20 percent. Several noted that sometimes the pdf print version has been slow to be posted. The CW staff will be more diligent about having that posted before the email is sent. By the way, the randomly-drawn winners of dining hall cards were Kelly Hedgecock (Moore Nursing Building), Ann Perdue (Jackson Library) and Tiffany Wright (Foust Building). Callin’ all crawlers! The Baby Derby is back. We’re looking for babies 6 to 12 months who think they have what it takes to win UNCG Athletics’ halftime crawling competition on Sunday, Feb. 25, as UNCG Men’s Basketball hosts Samford at the Greensboro Coliseum. The winner will receive a $250 Babies R Us gift card. All participants will receive up to four complimentary tickets for the family. For more information or to register your child email bluegold@uncg.edu. Parallel to the Banner 9 implementation, course, schedule and student data will be restructured and cleaned up to support streamlined data entry and increased effectiveness in reporting. This has been a year-long effort to better align the data within Banner to meet UNCG’s needs. If you work with course, schedule and/or student data in Banner, DegreeWorks, or WebFocus Reporting, please plan to attend a student data information session. The University Registrar, Michael Gaines, and ENGAGE Executive Director, Kristine Sunda, will present detailed information on new policies, student data definitions and changed processes. Key data definitions impacted are new campus definitions (on campus vs. online), majors/concentrations, course schedule types and instructional methods, and student types. New policies define these data and the usage.Changed processes include departmental approvals for major changes, online section creation, and student data integration and reporting requests. Information will also be presented on the new university reporting tool, Argos, which will offer efficient data collection and improved student data analysis. UNCG Music’s Dr. Lorena Guillén has been shining a spotlight on the unique stories of immigrants. Guillén, a performer and professor of musicology, is a highly awarded singer, songwriter and conductor. A native of Buenos Aires, she had been looking for a way to engage with the community, and to help Latina women share the stories of their journeys from their countries of origin to North Carolina. Guillén says the music and story, performed by her Tango Ensemble, transcend politics and stereotypes. Guillén holds a Master’s in Vocal Performance and a Ph.D. in Historical Musicology and Music Theory from State University of New York at Buffalo. She has taught as a lecturer at UNCG since 2007, and has previously taught at Wake Forest University, Hartwick College (NY) and SUNY at Buffalo. If you’d like to learn more about Guillén’s work, visit https://www.lorenaguillen.com/the-other-side-of-my-heart. See the work: Saturday, Jan 27, 2018, 8 p.m., UpStage Cabaret at Triad Stage: Concert Album Release of “The Other Side of My Heart” with the Lorena Guillén Tango Ensemble. Tickets on sale at Triad Stage box office. Copy drawn from CVPA web site. See full story by Terri Relos. On Thursday, Feb. 1, UNCG will coordinate a regional law enforcement oriented, mass casualty exercise. It will take place in and around the UNCG McIver Building. Simulated gunfire may be heard between the hours of 9 a.m. and 11 a.m.
To ensure a safe exercise, the operation and location of the scene perimeter will result in temporary changes to daily campus operations. There will be a security perimeter established around the exercise to ensure members of the campus community do not enter the exercise area. This will be one of the largest such drills in UNC system history, and it will necessitate the closing of some roads and sidewalks as well as some parking areas (see map here). Additionally, all vehicles parked inside the exercise perimeter will be required to move by January 31 by 8 p.m. See image above for exercise perimeter. As a result of these road closures, Spartan Chariot routes have been altered slightly for the day. For those who would normally embark and disembark at the Administration Drive/College Avenue stop, organizers ask that you embark and disembark at the Walker Circle bus stop. The stop at Administration Drive/College Avenue and Lot 7 at the Studio Arts Building, will be closed. For more information, including a map, visit: police.uncg.edu/McIverExercise. Organizations reps and UNCG employees met each other at the Kick-Off event. UNCG’s 2017 State Employees Combined Campaign goal was $200,125, to commemorate the university’s 125th anniversary. The goal was reached and passed. As of Friday, Jan. 19, UNCG had raised $201,564 and achieved 32 percent employee participation in giving. Chair Macea Whisettse reflected on the impactful campaign. She noted that 500 faculty, staff and retirees attended the SECC special events on campus in October and November 2017 that garnered a total of $2,597.27. Because of your generosity, , she added, thousands will continue to receive critical services and programming. Since the SECC began statewide in 1984, UNCG has raised $4 million. UNCG’s “Power of Giving” is our legacy. A specialized curriculum for autism. No more food deserts. Free mental health care. Anti-bullying reform. Ending child homelessness. For six days in December, 60 aspiring student leaders developed skills to create a better world. “It’s a really empowering space for students to feel very supported, to have conversations they don’t normally have in class,” said Lindsey Woelker, OLSL’s associate director for leadership and one of the organizers of the institute. It also provides faculty and staff an opportunity to get to know students in a unique way, outside of the classroom, Woelker added. “We’re in it together – both teaching and developing students,” she said. December 2017 was the fifth year UNCG offered the program, which is open to all undergraduate students. This year’s institute took place at YMCA Camp Weaver. The curriculum builds over the course of six days, with daily themes and sessions that explore defining leadership, emotional intelligence, inclusive leadership, communication, group decision-making, setting goals, living with integrity and putting vision into action. Day seven, Woelker said, is considered the rest of your life. “It’s a catalyst for students to recognize it’s not only important to dream about what could be, but to envision it and go after it and make it happen,” said April Marshall, OLSL’s assistant director for leader development. This year, Woelker and Marshall brought in UNCG alumni to talk with students about life after graduation and community involvement. Students who participate in LeaderShape often remain involved and more connected to campus, and join or start organizations, Woelker said. Faculty and staff interested in facilitating at future LeaderShape institutes should contact April Marshall, aamarsha@uncg.edu. 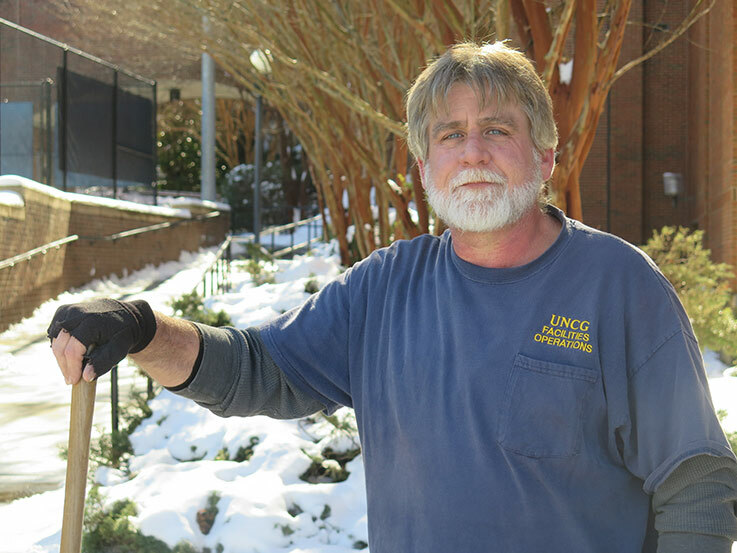 Eight inches of snow hit UNCG last Wednesday. Offices and classes were closed Wednesday and Thursday, reopening Friday at noon. Many staff worked to ensure the students were cared for and the university continued to operate. From Dining Services making sure the students and support staff had breakfast, lunch and dinner at the dining hall (see tweet) to Housing & Residential Life making sure the students’ needs were cared for, the unexpectedly large snowfall was dealt with. 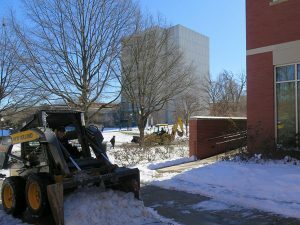 UNCG Grounds staff led the effort of clearing the snow and ice. Jeff Hawkins (Grounds) noted they applied several hundred gallons of brine before the snow hit Wednesday. It began before daybreak and continued till late in the evening. They made a “gigantic effort” as the snowfall ended to clear the snow and ice. Offices reopened and classes resumed at noon Friday. White explained that they hired a contactor to clear streets and parking lots. 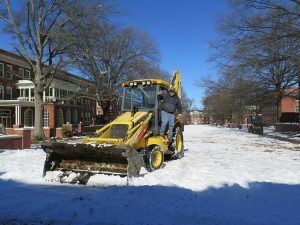 They focused on clearing the rest (and did some work on the parking lots themselves later in the week)..
“The guys (in Grounds) have worked overtime the last days,” he said in a brief interview at the Grounds shop Friday morning. Terry Goins (Grounds) was in the Grounds shop, preparing to go back out. He noted their approach to dealing with the remaining snow that day (Friday): “We’ll work longer hours.” He noted that part of their morning work was applying ice-melt to walkways – and they’d “hit the parking lots” again that day too. At midday on Friday, Robbie Gray (Facilities) was clearing snow near employee back entrances at Coleman Building, where he works in Maintenance for the building. 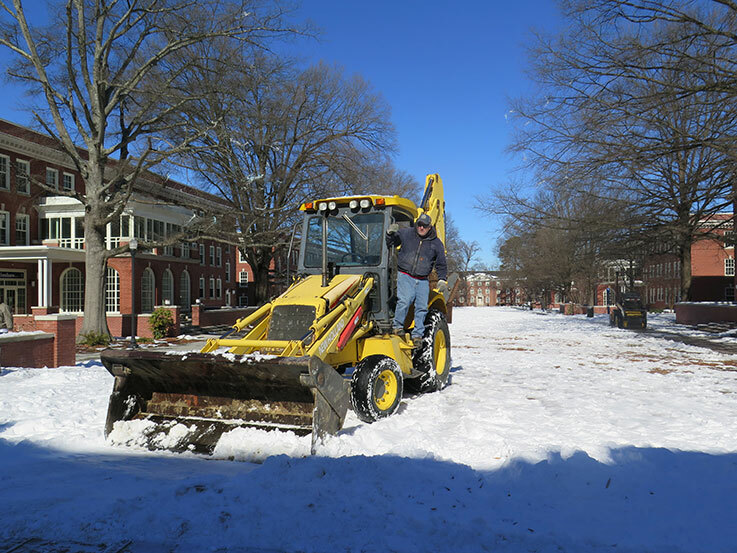 Jeff Hawkins (Grounds) on a Bobcat and Lee Martin (Grounds) on a bulldozer cleared additional snow off walkways at the Quad. Hawkins spread more ice-melt. Eight inches of snow is a lot. Text and photos by Mike Harris. The University of North Carolina System’s past is a proud and storied one, closely tied to the history of our state and tightly linked to the economic growth and prosperity North Carolina has increasingly enjoyed. In 1931, the merging of UNC-Chapel Hill, NC State, and UNC Greensboro created the state’s first consolidated System. In 1971, a 10-school expansion and the creation of the governance structure we still maintain cemented the System’s role as a statewide engine for opportunity. Today, the University of North Carolina System is known nationally and internationally as a world-class teaching and research enterprise. Our 17 institutions, individually remarkable and collectively extraordinary, are empowering students, driving innovation, and enriching the communities around them. We have long delivered transformative results for our state and its citizens. But we can do more to harness our institutions’ individual voices and strengths to speak and work together in pursuit of our shared goals. That’s what we are doing today as we launch a new logo and identity for the UNC System and two of our newest initiatives: NC Promise and our UNC Lab Schools. As of today, we are no longer known as UNC General Administration; instead we are recognizing our role for what it is, with a new title: the University of North Carolina System Office. We’re proud of our new look and I encourage you to take a moment to view our launch video and new logos. It’s a new look for a new era. An era of higher expectations. One in which more is expected by employers of our students, more is expected by taxpayers of higher education, and more is expected by policymakers of our System’s effectiveness, accountability, and efficiency. Since the System was organized in 1971, enrollment has almost tripled from 88,000 to 225,000. Our revenue sources have become more varied and complex. Our regulatory burdens have soared. Even our mission—the degree to which we are invested in our regional economies and communities—has changed. This is the start of a new period for the System. Together, we can rise to meet the moment. United, we can seize the opportunities ahead, while preserving the independence and identities of our institutions. A strong System means our institutions can focus on their core mission: providing North Carolinians the full promise higher education holds. Thank you for your hard work and commitment to extending higher education’s benefits across the state. The work you do is what allows our System to meet the needs of all North Carolinians. University Libraries will host a Diversity and Global Engagement Expo on Jan. 31, from 2 – 5 p.m. in the Reading Room on the first floor of Jackson Library. The expo will feature a collective sharing of music, food, culture and values. Students groups will be present and there will be drawings for prizes. Join UNCG faculty and staff in conversation promoting the importance of diversity and multiculturalism on campus with a panel discussion beginning at 4 p. m. The event is co-sponsored by the University Libraries, the Student Government Association and the International Programs Center. UNCG has placed 20 student-athletes on the 2017 Fall Academic All-Southern Conference Team. The Spartans had eight members qualify from women’s soccer, five from volleyball, three from men’s soccer, three from women’s cross country and one from men’s cross country. To be eligible for the academic all-conference team, student-athletes must carry at least a 3.3 cumulative GPA entering the fall season and were required to compete in at least one-half of their teams’ competitions during the recently concluded fall campaign. In addition, the student-athletes must have successfully completed at least 24 credit hours in the previous two semesters. The Spartans have four student-athletes on the list with perfect 4.0 GPA’s. The UNCG narrative and visual identity will be the topic at the faculty forum, 3 p.m. at Alumni House’s Virginia Dare Room today (Wednesday, Jan. 24). Jeff Shafer, associate vice chancellor and chief communications officer, will address the faculty forum on this topic. Additionally, updated dates for open meetings for faculty to continue to provide updates and drive conversation and feedback are listed below. These are updated due to the snowstorm last week. Registration for faculty members will open soon at workshops.uncg.edu – see “University Communications” tab. The talk “Disasters are Us: The Anthropocentric Roots of Mayhem” will be presented by Dr. Steve Kroll-Smith Friday, Feb. 2, 2018, in the Faculty Center, 12:15 p.m.
From the Great Chicago Fire of 1871, to the earthquake and firestorms in 1906 San Francisco, to the flooding of New Orleans in 2005, to Superstorm Sandy seven years later, to the recent Hurricane Harvey inspired mayhem in Houston, and, the havoc Irma wreaked on Puerto Rico, a single narrative thread ties together America’s historic catastrophes. The noteworthy source of human misery in each of these disparate disasters was not the destructive agent, the atmospheric or geologic event. It was, rather, the work done in the name of disaster relief that created the most telling and lasting trauma. Drawing on work he recently completed on the 1906 San Francisco calamity and Hurricane Katrina in 2005, Professor Kroll-Smith sketches out the broad outlines of market forces that inevitably work against humane and successful efforts at recovery. Professor Kroll-Smith will close with some brief comments on the anthropogenic roots of climate change and the unsettling idea that we humans are the only species on earth that can think our way to extinction. Tiffany Henry (Technical Services, University Libraries) has been awarded a Code4Lib Diversity Scholarship, which will support her attendance at the 2018 Code4Lib Conference in Washington, D.C. Code4Lib is an annual gathering of technologists from around the world, who largely work for and with libraries, archives and museums and have a commitment to open technologies. Code4Lib strives to build collaboration across vibrant and diverse communities. There have been over 600 overdoses from opioid in Guilford County since January 2017. This project leverages one-time funds allocated by the NC General Assembly to design, implement and evaluate a rapid response program intended to decrease mortality from opioid overdoses among the opioid user population. Guilford Solution to the Opioid Problem will engage citizens who overdose in harm reduction practices, distribute naloxone, conduct community health education, coordinate community resources and build relationships focused on ending opioid overdose. The project will also include extensive evaluation and research components. Ten of the 17 bat species found in North Carolina are species of greatest conservation need. To monitor bat distributions and population trends in the mountains, the North Carolina Wildlife Resources Commission (WRC) implemented the North Carolina Bat Acoustic Monitoring Program (NCBAMP) in summer 2011. In 2015, the WRC, in partnership with UNCG, set up the North American Bat Monitoring Program (NABat) to expand the summer bat monitoring effort from the mountains to the entire state of North Carolina. In winter of 2016-2017, an NABat winter monitoring network was developed to gain information on winter bat activity patterns and distributions. The play on the court is fun to watch. The support on the bench is just as great. Jack Konstanzer, Taqqi Muhammad, and CJ Coleman show how just because you don’t play in the game, doesn’t mean you can’t impact it. Get an inside look at UNCG Men’s Basketball’s “Bench Mob.” And catch the big home game tonight (Wednesday) against Furman. Join these guys in cheering on the team. Update: Due to inclement weather on Jan. 17, this event has been rescheduled for Monday, Feb. 12. All times and locations remain the same. For the sixth consecutive year, UNCG and North Carolina A&T State University will host a joint celebration in honor of Dr. Martin Luther King Jr. The event was scheduled to take place Wednesday, Jan. 17, at 7 p.m. at Harrison Auditorium on the campus of N.C. A&T, but it was postponed due to the weather. It will be rescheduled. To learn more, visit intercultural.uncg.edu and olsl.uncg.edu. The world-renowned Limón Dance Company will perform at UNCG Auditorium Friday, Jan. 19, at 8 p.m. as part of the 2017-18 University Concert and Lecture Series. The company, now in its 72nd year, is recognized for its technical mastery, dramatic expression and eclectic repertory. It serves as the living legacy of dance theater developed by the late José Limón and his mentors Doris Humphrey and Charles Weidman. In addition to the public performance, the dance company will hold a master class for students on Friday morning. For the greater Greensboro community, the performance is an opportunity to see some of the world’s best modern dance in person. Tickets are $30 for adults, $25 for seniors, $20 for UNCG faculty and staff, $10 for non-UNCG students and $5 for UNCG students. To learn more and to purchase tickets, visit ucls.uncg.edu.